We tottered together upon the brink of the fall. I have some knowledge, however, of baritsu, or the Japanese system of wrestling, which has more than once been very useful to me. I slipped through his grip, and he with a horrible scream kicked madly for a few seconds, and clawed the air with both his hands. But for all his efforts he could not get his balance, and over he went. The Bartitsu Club of London had not yet opened in 1894, when "The Empty House" is set, but Conan Doyle never let a few facts stand in the way of a good story. After the Club closed in 1903, Bartitsu faded from public consciousness, while the fateful dropped 't' meant that baritsu was thought to be a product of Conan Doyle's imagination. Because of its association with Sherlock Holmes, the fictional martial art of baritsu achieved a fame its real counterpart did not. Doc Savage and the Shadow were practitioners, and in the highly popular Soviet Sherlock Holmes television series, both Holmes and Watson were masters of baritsu. For decades the elusive and mysterious baritsu was pondered by scholars, martial artists, historians, and Sherlock Holmes enthusiasts, who published essays arguing that Arthur Conan Doyle misspelled or misremembered and had intended to describe bujutsu, sumo, ju jutsu, or judo. Documentation of Bartitsu survived in a series of informative articles published in the long-defunct Pearson's Magazine, but the few copies lay forgotten in attics and Bartitsu remained quietly obscure. 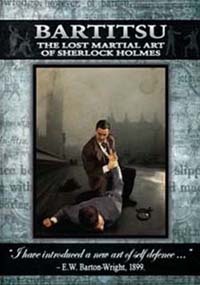 A 1958 article in The Baker Street Journal cited the Pearson's articles and correctly made the connection between baritsu and Bartitsu, but oddly enough, it, too, was forgotten and it was not until the 1980s that the "lost" martial art of Sherlock Holmes was identified as Bartitsu. Since then, a unique group of martial arts historians have strived to shed light on Bartitsu and on 19th-century 'antagonistics' and physical culture. Antique training manuals and century-old newspaper clippings, postcards, and other historic materials have been preserved, archived, and republished on Lulu by The Bartitsu Society and by others working to preserve the history of Western martial arts. Bartitsu: The Lost Martial Art of Sherlock Holmes reveals an exciting world of Victorian ruffians, garroting panics, militant suffragettes, and physical culture, as well as the colorful life of Bartitsu's founder Edward Barton-Wright. Featuring interviews with prominent historians and commentary from novelists Neal Stephenson and Will Thomas, Bartitsu is hosted by Tony Wolf, a world-renowned expert on 19th-century 'antagonistics', founding member of The Bartitsu Society, and key force behind the revival of Bartitsu as a practical martial art. 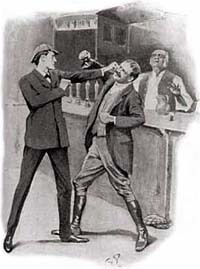 Illustrations from the original Holmes stories are animated, paying tribute to the literary connection without which Bartitsu may have been forgotten forever. Music by the steampunk band Abney Park creates a moody atmosphere of Victorian danger, excitement, and heroics. Through interviews, re-enactment, archival images, and contemporary footage of neo-Bartitsu students, the "lost" martial art is brought to life. Bartitsu, the "gentlemanly art of self-defense," was the innovation of British engineer Edward Barton-Wright. He lived for three years in Japan, where he trained in the art of Ju Jutsu, which was to become one of the foundations of his unique martial art. In 1899 he opened the Bartitsu Academy of Arms and Physical Culture in London, attracting a clientele of middle- and upper-class men and women. Bartitsu had a brief but notable zenith, sparking an interest in self-defense, a revival of the "manly arts," the rise of Amazonian feminism, and the growth of physical culture in England. The Bartitsu Club closed its doors in 1902, and Bartitsu and its founder were all but forgotten for the better part of a century, but the influence of Ju Jutsu and of martial arts as a discipline and a way of life for Westerners would persist for decades. Historians Emelyne Godfrey and Mark Donnelly describe the Victorian street crime and the atmosphere that made the London public receptive to the idea of self-defense training. The 'garroting panics' were a particular dread; lurid newspaper accounts furthered the fear and sparked the invention of bizarre anti-garroting devices, such as a spike-studded steel collar and a gun worn across the back that could shoot bullets into the would-be garrotter. Satirical cartoons of the era depict a man with enormous spikes strapped to his legs. Godfrey explains that such devices were perceived as somewhat "unmanly," and Bartitsu offered a gentlemanly alternative to relying on these unwieldy gadgets. The Bartitsu Academy of Arms and Physical Culture operated between 1899-1902 and taught the "New Art of Self Defence" to middle and upper-class men and women - though classes were separated by gender, teaching martial arts to women was still highly unusual for the era. Students learned to lock and throw assailants and to use canes, parasols, and improvised weapons for protection. Barton-Wright gathered instructors from around the world and Bartitsu combined principles of savate, Ju Jutsu, Vigny cane-fighting, and boxing. Wrestling and historical fencing were also practiced at the Club, and it became a center of physical culture in turn-of-the-century London. Students cross-trained in all the arts, and Bartitsu has been described by some as the first "mixed martial art." It is likely the first martial art to combine Eastern and Western practices, and the first to teach martial arts to Western women as a matter of course rather than isolated exceptions to the general rule. 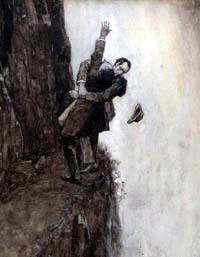 The famous struggle between Sherlock Holmes and Professor Moriarity at Reichenbach Falls in "The Final Problem." "The next few minutes were delicious. It was a straight left against a slogging ruffian. I emerged as you see me. Mr. Woodley went home in a cart." Sherlock Holmes uses 'scientific pugilism' against an unschooled thug, taking no small degree of satisfaction in trouncing him in "The Solitary Cyclist." Disguised as a French laborer, Sherlock Holmes rushes to the aid of Dr. Watson, striking his assailant over the forearm with a cudgel in "The Dissappearance of Lady Frances Carfax." Club members were expected to practice a variety of arts corresponding to different ranges of attack. "Scientific" pugilism was a battle of wits, not brawn. Savate was a graceful form of kickboxing. French master-at-arms Pierre Vigny taught defense with a walking stick, and two Japanese instructors taught the elegant throws, locks, and holds of Ju Jutsu. Bartitsu's principals were socially connected to ideas that were deeply ingrained in the late Victorian era society: class, honor, style, respectability, and what it meant to be an English gentleman. The re-enactment is a particularly delightful aspect of the documentary. A pair of re-enactors give a taste of what it may have been like to train in Bartitsu. Ju Jutsu throws and locks, Vigny cane fighting, and "scientific" boxing are practiced in turn. It illustrates how "antagonistics" transitioned from the domain of Victorian ruffians and foot-soldiers to a suitable pastime for gentleman. In some ways, this was a revival of the "manly arts" that characterized the upper-class education of Renaissance and Regency men. As evident by their attire and the house in which they are training, the re-enactors are two gentlemen, not common bruisers. 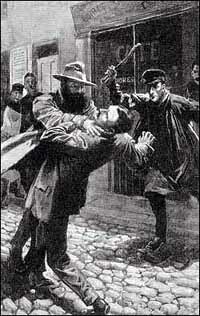 Bartitsu provides a means of self-defense suitable to one's station, an important notion to the Victorians. A walking stick becomes a formidable weapon, yet retains its quintessential role as the accoutrement of a gentleman. Bartitsu was also taught to women. By the turn of the century, women could freely enjoy bicycling, golf, bowling, and tennis, but the concept of self-defense for women was unusual for its time. Bartitsu and Ju Jutsu played a key role in the militant suffragette movement, which is described with period illustrations, photographs, and a lovely re-enactment of the training of the Jujitsuffragettes, a corps of bodyguards charged with protecting the movement's leaders from interference with the police. Edith Garrud, who later opened her own martial arts school with her husband William, was a founding member of the militant suffragette movement and her school provided a bolt-hole for activist women escaping conflicts with the police. Clad in white gis and twirling Indian clubs, the re-enactors practice throws, crowd work, holds, and locks, and provide a glimpse of the determination of the early agitators for womens' rights. In a segment shot at a Bartitsu seminar in Italy, Tony Wolf muses on being a New Zealand instructor teaching a Victorian English martial art to Italian students in the 21st century. Wolf explains that students of Bartitsu must be like "martial arts archeologists" in order to practice Bartitsu as a living martial art. Novelist Neal Stephenson describes the "brain trust" of international martial experts in that Barton-Wright had assembled, and speculates about what they might have gotten up to after-hours. Since Barton-Wright was constantly defining his self-defense methods and incorporating knowledge from an array of experts, training clubs around the world have adopted a "neo-Bartitsu" approach, refining the self-defense techniques in the manner of Barton-Wright a century earlier. One of the most engaging segments of the film is the re-animation of the frame-by-frame cinematic photographs of Ju Jutsu throws from Sadakazu Uyenishi's 1905 Textbook of Ju Jutsu. This may well be the earliest footage of any Japanese martial art in existence. To see these photographs brought to life is extraordinary. Ju Jutsu is now practiced by thousands of Westerners, and it has influenced Aikido, Judo, Brazilian Jiu Jitsu, and many other martial arts that are widely practiced worldwide. That thousands of children today are ferried to dojos after school would not be possible without the spread of Eastern martial arts in the West. But at the turn of the century, Eastern martial arts were virtually unknown in England, and watching the old footage of the Ju Jutsu throws is like watching history unfold. No one really knows why the Bartitsu Club closed its doors. Barton-Wright quarreled with his instructors, made a series of bad investments, and applied his energies to electro-therapy inventions, some of which were innovative, others questionable. Other martial artists took up his initiative, and the throws, holds, and locks that characterize Ju Jutsu were incorporated into police and military techniques. Ju Jutsu was even taught to the Boy Scouts who earned a "master-at-arms" merit badge for learning its techniques. As for Barton-Wright, he was rumored to have taught Bartitsu privately at least until the 1920s, but little is known of his later life. It appears that his focus was on physical and electrical therapy and he ran and operated several medical and therapeutic clinics. He died in reduced circumstances in 1951 at the age of 90, and was buried in an unmarked grave in Surrey. Barton-Wright was highly influential in the spread of martial arts in the West, so how is it that he was all but forgotten for the better part of a century? Bartitsu: The Lost Martial Art of Sherlock Holmes attempts to answer that question, while acknowledging that we may never know why Bartitsu lapsed into obscurity. Historians Harry Cook and Graham Noble suggest that Barton-Wright was a trailblazer whose time had not yet come: "Anyone's who ahead of their time... when fashions change, they are forgotten. It's not like they are pushed in the background, it's like they were never there at all." This idea is made poignant by the scene in which Tony Wolf visits Kingston Cemetery, where he thoughtfully places a bouquet of long-stemmed flowers against a tree near Barton-Wright's unmarked grave. In paying tribute to his work, the film-makers have not forgotten that he was a man whose life and accomplishments were, until quite recently, remembered by none, and this brief graveyard scene touchingly personalizes Barton-Wright. The efforts of those who created this documentary, of The Bartitsu Society, and of the many practicing martial artists, historians, and enthusiasts have ensured that Bartitsu and the man who pioneered it are not only remembered as history, but revived as source of inspiration for those who continue to refine and develop the art of self-defense. For more information about Bartitsu, visit The Bartisu Society Web site at www.bartitsu.org.